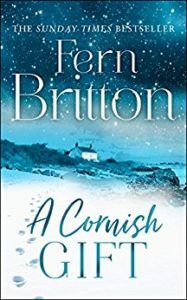 My review today is for A Cornish Gift by Fern Britton. I enjoyed The Postcard so much that Emilie Chambeyron offered to send me this one for review and of course I accepted. My thanks to Emilie and Harper Collins for the review copy. So what’s A Cornish Gift all about then? Add a little magic to your Christmas with this fun, festive collection of warm and witty short stories from Sunday Timesbestselling author Fern Britton. Christmas comes to the little village of Pendruggan and Cornwall’s very own Mr Rochester, Piran Ambrose, discovers the true meaning of the festive season when even he can’t resist the village celebrations. Meanwhile, best friends Penny and Helen are embarking on a stolen weekend of blissful indulgence but best laid plans often go awry and the ladies are in for a big surprise. In an idyllic cottage on the Cornish cliffs, the Appleby family and their bearded collie, Molly, are having a holiday to remember. It’s time for a little Cornish escape for all. It’s available now in ebook and hardback. Having read The Postcard a few months ago, I was delighted to be able to read more of Fern Britton’s work. She has such a warm writing style and it’s lovely to be able to return to Pendruggan and Trevay, the fictional Cornish homes of her characters. In A Cornish Gift, we are treated to three stories of around 100-130 pages each. The length means that there is plenty to get your teeth into, lots of action to keep the reader interested. I know that these stories have been published elsewhere before being made into this one book, but I hadn’t read any of them. The first is A Cornish Carol which is a story of redemption, of the joy of Christmas overcoming the things in life that might get us down and make us feel miserable. Piran Ambrose is the main player in this one, but his partner, Helen, is also quite prominent. I liked this story because it was ultimately a feel good Christmas read. However, this book is not one to only confine to the Christmas reading pile because (a) it’s about the meaning of the story rather than the festive season and (b) the other two stories are not about Christmas at all. The second story, The Beach Cabin, is about Penny Leighton’s location manager, Ed Appleby. Penny Leighton is a TV producer and readers will know her from previous books, including The Postcard. But Ed and his family are the focus here and again it’s about turning around your life and looking for the good instead of the bad. The third story is about A Stolen Weekend away in London for Penny and Helen. What I liked about this one is the message that the grass isn’t always greener on the other side but sometimes we need to see the other side to realise it. A Cornish Gift was a lovely, lovely read. It’s charming, heart-warming, easy to read fiction at its best and it’s got me really looking forward to reading more books by Fern Britton. Fern Britton is the highly acclaimed author of five Sunday Times bestselling novels:A Seaside Affair, The Holiday Home, Hidden Treasures, New Beginnings and A Good Catch. Her books are cherished for their warmth, wit and wisdom, and have won Fern legions of loyal readers. Fern is likely best known for her years co-presenting ITV’s flagship daytime show This Morning with Philip Schofield. An iconic presenter, she is also hugely popular for her earlier hits like Ready Steady Cook, and All Star Mr and Mrs, as well as being a much-loved contestant in 2012’s Strictly Come Dancing. She recently presented The Big Allotment Challenge for BBC2 in 2014 and again for its second series in 2015, as well as For What It’s Worth, an antiques-based quiz show on BBC1. Fern lives with her husband, Phil Vickery, and her four children in Buckinghamshire and Cornwall. To find out more, connect with her on Twitter and Facebook or visit her website.